I meant for some time to get to this important city of Fayette County, but one item or another kept me from giving it all my attention and resources. So, I got out my camera and a few maps and delved deeper into the subject. This post is about the unique history of Connellsville, once a large borough north of Uniontown, the county seat. It was incorporated in 1806, in Fayette County Pennsylvania and in 1906 became a city. It is beyond our scope to attempt a significant rundown from A-Z, so a patchwork of the region will have to suffice. Any locals that would like to add something interesting, please help to fill in the blanks. The city that joined with New Haven about 1917 is as interesting in details as it can be captivating in it's depth. 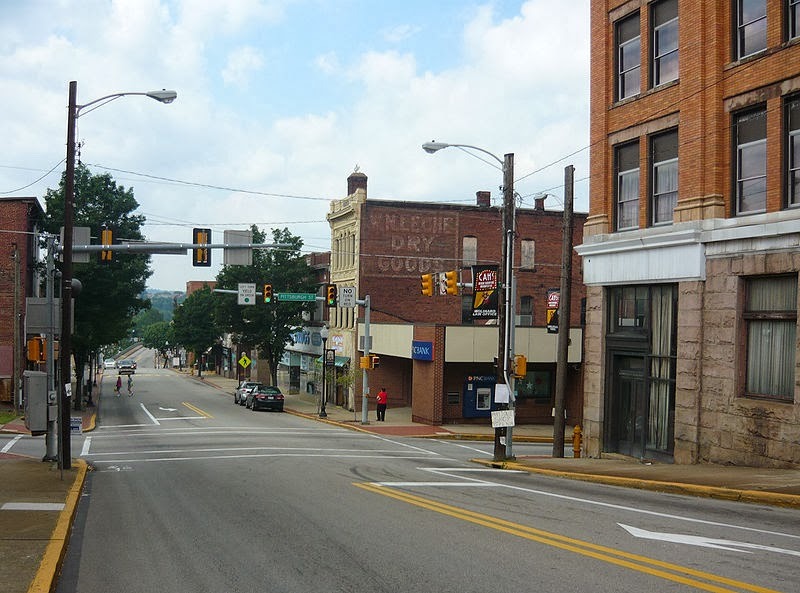 Lying near the heart of what is termed the Connellsville Coalfield, the borough is partly circled on the west by the Youghiogheny River, an important resource that called people to the area and to where many started settling in the late 1770's. This included the French from the north as well who claimed this land and the Delaware, Shawnee and Kanhawas and other tribes of Indians who were here even earlier. The coal strike labor dispute situation in 1891, led to some serious violence. The timber was a real attraction, especially the oak trees and, of course, the coal and ore production. The coal was baked to harden into coke, thereby used to smelt the iron ore. This was the custom all around the area. The fur trade was very popular too. The Catawba Indian Trail crossed through the region and the Ohio Company were heavily involved in exploring as they also hunted and trapped. Christopher Gist had major involvement as a surveyor from Virginia and then as a resident. He was a confidante, guide and friend of a young George Washington, who himself a surveyor, passed through here by way of Stewart's Crossings at different times, on his way to Le Beouf and later, Fort Duquesne experiencing much of the regional places and customs leading up to the French and Indian War. General Braddock's march led through his army through here and forded the Yough River at Stewart's Crossing. There, will be found Colonel Crawford's Cabin, though reconstructed, and the remnant of road named for his efforts, especially Washington's, which ended in a tragic defeat, only rectified by the Forbes Expedition and Bouquet's route clearing of the Glade Pike. You will find more on this fascinating event of historical import on the post about the Yough River Park reenactment I attended in late June and I also invite you to check out my post on a route traversed in Upper Tyrone of The Lost Cemetery and Braddock Road. There is a more recent investigation related to the Braddock Road and Turkey Foot Road remnants near the Walnut Hill area. This will help give much extra information and allow for a better overview of this historical subject. Washington made his way here again toward Fort Le Boeuf, near Erie PA, to meet and discuss the encroachment of the French beforehand. Gist eventually came to dwell at Mount Braddock. The dastardly, dashing French of the time managed to destroy most, if not all, of his settlement. There is also much quality info from the Korns.org site in a pdf. file right HERE. George Washington also met the Half King Seneca Indian leader Tanacharisson close by at Jumonville where he also helped fight the French 'scouting party' at Jumonville Glen near Dunbr's Knob and caused some serious diplomatic troubles with the lifting of scalps. As is well known, thus began the French and Indian War with the famous 'shot heard round the world.' The rest is our history, folks. It should be noted that Providence Mounts of Bullskin lived near Connellsville at White's bridge, (the run was named after Henry White), on Whites Run. According to 'The History Of Fayette County", by Franklin Ellis, page 486, "At the mouth of White's Run, and partially in the present township of Connellsville, was the tract of land owned by Providence Mounts." He goes on to say, " Providence Mounts was probably the earliest of these settlers, and the principal stream of the township took its name from him. Just below the Bullskin line. Mounts had a mill at a very early day, and wool-carding was carried on at the same place." he was also involved with clearing the old Turkey Foot Road and was a Sheriff of Westmoreland County. More on that at another time. Speaking earlier of Indians in the area, (were we? well, we are now! ), a friend I recently collaborated with, quoted something for me: 'the 1906 Borough of Connellsville' mentions: Indian village (surely burial close by), by Yough River between Adleaide Rd and Georgetown Manor area: Oglevee Lane, top of where Braddock Road intersects'. Well, I appreciate the reference being pointed out to me. Isn't that interesting now? I plan a future post on the Indian villages in our region and a map schematic for this eventually. There is more to be looked into from the hard to find book, "The Other Side Of History" on the subject of Indians in our region, and I will look into including this shortly. The city was indeed influenced heavily by the Whiskey Rebellion of 1794 as the tax was felt strongly here as well as other counties, towns and villages. One officer, Benjamin Wells, was even driven out and his home burned, which would of made quite a statement by the upset farmers and angry distillers. The uprising was soon put down by, none other, than George Washington and his Army of the new Republic of the United States. Colonel William Crawford's figure stands majestically, and yet somewhat tragically, in front to the Carnegie Free Public Library, built over an old cemetery in 1901, partly with funds from the tycoon Andrew Carnegie. He was captured, tortured and burned at the stake on the Sandusky expedition in Ohio. I decided against recounting his suffering in detail, except that his bravery was said to be nothing less than amazing and inspiring during this tortuous ordeal. Crawford came from what was Frederick County, Virginia, being born in 1732, that from 'History of Fayette County, Penn. ', 1882, Franklin Ellis. He had moved to near Stewart's Crossing on the Youghiogheny by 1765, convinced by the state government that this was a part of Virginia. Washington was suppose to of stayed at his home around 1770, which seems very likely, as he was a fellow surveyor and lieutenant under Washington by 1758. He was also a half-brother to the Stephensons. ('Forbes Expedition', 1941), and commissioned a Colonel of the 7th Virginia Regiment by 1777. He was in many of the campaigns, (at least six), of the Revolutionary War. He also served at Fort Pitt in the late 1770's and was on Forbes' successful march. His life ended very tragically in Sandusky in 1782, at the hands of the Shawnee Indians, (Washington-Crawford Letters). Some 'Blue', (or 'Black'), Mingos also, which were mostly a blend of Seneca and Cayugas. There is the Colonel Crawford Burn Site Monument in Wyandot County in Ohio commemorating his death in 1782 on the Sandusky River where he led Pennsylvanians in reprisal to destroy Indian villages in the Crawford Expedition. His re-created cabin resides at the Yough River Park, along with the spring house. This was also where William Stewart, an early settler, made his crossing and Major General Braddock took the army through the west side of Connellsville during the famed French and Indian War. This place exudes history like an aromatic calendar! The Community held the historic Braddock's Crossing festival and 'Art on the Yough' show at the end of June and I made it there as well. More information on that event is added at the link above and more material on Stewart will be upcoming. Crawford's Memorial statue and plaque can be easily observe in front of the Carnegie Library, 1260 yards from where, in 1765 he had his cabin. He is listed as pioneer, patriot, but first of all, 'friend of Washington'. As an afterthought, I suppose it interesting and a bit ironic, that the Old Connell grave yard was the site of the new Library. So at this time of year, maybe it is fitting to relate there are the reports of hauntings in the quiet realm of microfilm and newspapers! Thus, when removing the bodies to Chestnut Hill, according to the Fayette County Cultural Trust, this caused much dissension in the community and was thought of as a a ghoulish undertaking. Out from old books come some surprising, even titillating tidbits, gems and stories, often without much in the way of source material to go on. Yet, there can be substance behind the traditional tales, especially as it is known the Indians were certainly in this area. The Connellsville Historical Society may well be able to help fill in the blanks with some meaningful knowledge on the subject, so give them a try. There is information that a particular, though apparently, unmentioned, tribe of Indians had their village located about 5 miles east of Connellsville. 'Here' was an extensive burial ground where it is, or was, believed by tradition in these parts ' that one thousand red men slept'. So saying, another, and smaller village was located on the banks of the Youghiogheny River, as the crow flies, about two miles above the mouth of Bear Run. 'In both of these places a large number of flints have been found'. As stated above, I will have a separate post on Native American artifacts and burial grounds 'down the road' some day. So, just when some doubter, (oh those of little faith! ), thinks it unlikely for the appearance on the blog of something I promised, then, surprise, this is probably the time when I will deliver. Now that we have that straightened out, it is also believed there were some bold French traders from the Canada's settled in Fayette County as early as early as 1730. We do know, then the French built their forts in this 'section' and, technically, one George Washington was sent to warn them away, unsuccessfully, as they were on 'English lands'. This proved totally ineffective. On the trip out he spent a few days at the home of Mr., (Christopher), Gist at Mt. Braddock, a house technically still standing and refurbished. Gist had accompanied him as it has been claimed, as did William Crawford at times.Both were on the highly potent Forbes Expedition.This was wild country, with bears, buffaloes, cougars, elk and even wolves in the deep forests, as Thomas Hutchins made some mention of in 1764. He was in Bouquet's Expedition and was actually bragging up the area. As stated above, this area will be dealt with at another time. For those of you that live there, I won't forget to give your area special coverage, thanks. The 'Capstan Glass Company' of South Connellsville has quite a history. With hindsight, some of it is sad, and even tragic. This will all be covered in more detail soon. William Stewart and his brothers were pioneers that settled here near to the early 1750's, soon using the flatboats being made to ferry people across the Youghiogheny River. This was traditionally on the eastern embankment at Stewart's Crossings, very aptly named. This area was used later for barging materials down to the Monongehela River and on to the Ohio and places like the Mississippi Delta region and Louisiana. A house built by him in 1753 was burned by the French, (as was Gist's plantation at Mt. Braddock), after the British had the failed encounter at Fort Necessity and this drove him from the place of his new home by 1754. Zachariah Connell, 1741-1813, the tee-totaling son of James Connell, was an early and powerful settler to the region, was the generous benefactor from whom the city received its name, arriving here near the time of Washington and boarding for a while with Colonel Crawford I've said so much about. The man himself, the very structure of this city rested its laurels upon, hailed from Frederick,Virginia. At times he was found involved with land speculation quite early on, in what was then the older township of Bullskin. He was married to one Rebecca Rice and by, approximately 1770, he founded the nucleus of the borough named after him in 1806. He was a prominent judge and as stated above, a hearty Virginian of the jurisdiction of the West Augusta District of Youghioghania County of which this whole area was mistakenly thought to be part and parcel of, contrary to the strong views of the Penns'. Connell, a captain of the militia, was very influential with the Governor there, (not of Pennsylvania), Robert Dinwiddie, that history sometimes views, with reason, with Dr. John Connolly in the number one position, as quite a troublemaker. He also served under William Perry in the War for Independence. Connell had surveyed for himself a large tract of land called 'Mud Island' at the time and basically began the plot of the town beginning in 1793. He died at his Water Street home and is buried nearby. His wife Margaret passed on in 1845. His marker is about 100 feet below his grave site in the woods on East Francis Ave.
"A petition of Zachariah Connell was read, praying leave to bring in a bill, for the purpose of authorizing him, his heirs and assigns, to establish and maintain a ferry over the river Yoghiogeny, in Bullskin township, in the county of Fayette", with the hardly reassuring sentence following at the end, "Ordered to lie on the table." A lot of local products were shipped to the Monongahela by way of the 'Yough' and on to the Ohio and Pittsburgh areas. It was said that Zach owned over 2,500 acres in the area that is now Connellsville, though he lived in fairly humble circumstances. Under his tutelage the town was laid out at 45 acres and he granted the inhabitants many privileges. The charter bore the date March 21, 1793. Many of those that arrived here came by the Allegheny Passage southwest or the old Turkey Foot Road from the southeast from Maryland. During the famed French and Indian War period of the mid 1700's, (part of the larger theater of the Seven Years War), which was started at Jumonville by a small party of militia led by Washington reconnoitering a group of apparently nosy French from Fort Duquesne, the Half King, Tenasharison, helped lead them leading up to the unsuccessful attempt made at Fort Necessity. Isaac Meason, the landed Iron Magnate, who operated the Mt. Vernon Furnace and once lived at Iron Bridge, was said to be heavily involved in the frontier origins of New Haven in the late 1790's. 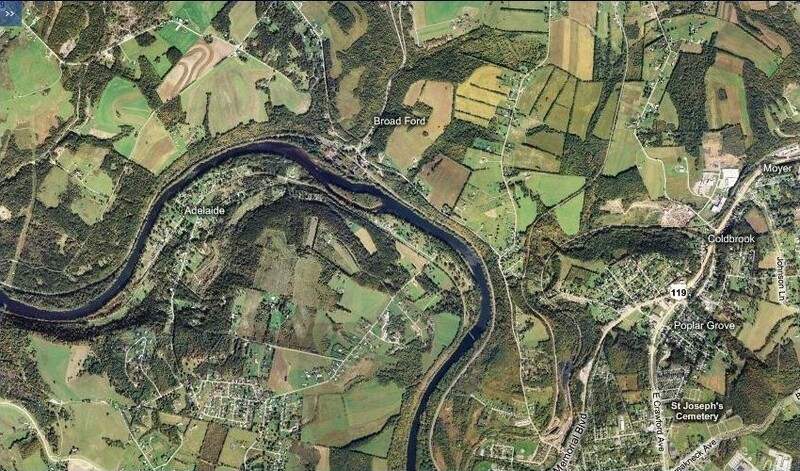 Below Broadford, not far from Adelaide, areas once associated with Native Americans, on the west side of the Youghiogheny in the late 1850's near to Crawford, but still in old Tyrone township, were the Sterling Mines. According to James Hadden in` his 1912 book, "Genealogical And Personal History Of Fayette County, Pennsylvania", Vol. 2, page 495, these four coke ovens were actually the beginning in early form of a coking operation by Mordecai Cochran who inherited the old Cochran farm nearby. The Cochran's had married into the Strickler family that owned much land toward Tyrone near Scottdale where Jacob Strickler ran a saw and grist mill close to where the Duraloy plant is located just inside East Huntingdon township. Apparently, this was taken over by Keifer of 'Kiefertown'. What became Sterling was established by Samuel Cochran, a Revolutionary War soldier who had spent that hard winter at Valley Forge. 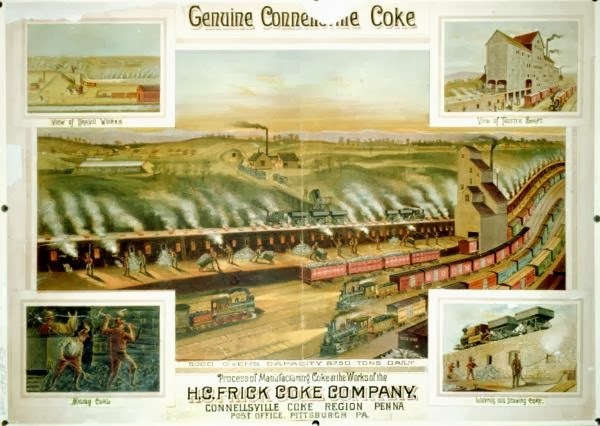 Often the coke was packed up and sent down the Youghiogheny to the Monongahela River until the railroads took prominence. These coal lands were soon expanded in the 1870's as Brown and Cochran. This is just an example of the numerous coal and coke companies of the borough. The first newspaper in Fayette, 'The Fayette Gazette and Union Advertiser', was begun out of Uniontown in 1797 by Jacob Stewart, whose sister, Elizabeth, was married to Jacob Strickler. (Their son Jacob B. Strickler, born in 1791, died in 1874, of that Kiefertown farm, was a Methodist preacher the same book, page 496. He inherited 165 acres there. He was a also a wagoner who drove whiskey around the surrounding areas. His son, Joshua, who learned the whiskey trade from his father, was a dedicated wagoner of the famed National Pike and lived into his nineties. I apologise if i temporarily 'left the area'. Maybe you will sympathize that I simply didn't know where else to put it!? The Keystone Courier was an early version of the Daily Courier. Abraham Overholt, 1784-1870, decided to expand the West Overton distillery in East Huntington Township, Westmoreland County. The distillery he built here at Broadford in 1880, without the frills, was completely overhauled in 1899. The development of the Henry Clay Mine and Coke Works, some of it near Galley Run, clearly experienced a lot of building and much work put into the site; the offices, granaries, boiling houses, fermenting, bottling and machine houses, engine rooms and various warehouses with upgrades were, in the 1930's, acquired by the National Distillers Products Corporation where it moved operations to Cincinnati, Ohio. Much acid pollution and effects of logging has decimated the place. A fair amount of it has been dismantled and demolished. From its beginnings toone hundred years later, with changes in ownership and investment problems, small fires and what not, the business petered out. Old Monogahela becoming Old Overholt was most definitely made here, as A. O. Tintsman, then C. S. O. Tintsman joined the business. There is still a product from Jim Beam which can be obtained in limited quantities of distribution. This hasn't been researched as well as maybe it could be, but it appears the Broadford Overholt Distillery plant was owned and used for some time by Westinghouse with some solar power operations in the latter part of the last century. Most of these have failed as to so much foreign competition, to be perfectly frank about it. This is partly according to second hand info with many good photos here, and a few other places that might of gotten misplaced. Certainly, a relative has a good site worth looking into. Since I knew a few people that worked for the company, I am aware that what became SPI moved to Rostraver where there were problems financially and they finally relocated to the old Sony plant near 2012, now managed by RIDC, between Mt. Pleasant and New Stanton, and were soon bankrupted by 2013. The site was then owned by Shallenberger Construction. The hamlet of Adelaide, or Maysville, near New Haven, had seen the building of the Cupola Mine in 1888. It is supposed the name came from either Henry's wife, or Adelaide Hogg. According to Cassandra Vivian, ('Hidden History of the Laurel Highlands'), this mine was not actually built by H. C. Frick, but he only purchased it from former owners. This mine lasted well into the 1940's. Many other mines were around the city, too numerous to elucidate in any real detail without appearing repetitive. I certainly hope not to bore anyone. There is also some talk of a theorized second Braddock crossing at Broadford. Do keep in mind, this was a part of the Yough flood plain, near the ruined trestle bridge. It has been assumed that areas with small islands over the years was the same as at Crawford's 'Mud Island' 250 years ago, making quite a stretch for accuracy and convenience. Not to personally get too caught up in the documentary evidence, or lack of it, I haven't found much substantial evidence of this sort, as most traditional documentation points to the Stewart Crossing as the main area for the Braddock Road crossing as it passed near by Opossum Run and Mounts Creek and on to the Narrows toward Everson by the borders of the Bullskin and Upper Tyrone townships. I mainly, take this view because the old surveys and maps do so rather consistently. Nevertheless, there is apparently an alternate tradition of the crossing of the colonial milita at Broadford taking a differing route of the Catawba Path to Mt. Pleasant. I am in the process of studying other sources concerning such a scenario and haven't come to any definite conclusions for this. Street car and trolley companies were big here quite early in history and very useful. Traveling from New Haven through to Dunbar was one route. Keep in mind, too, the amount of Historical Markers and places listed in the records of such are numerous. Various Railroads were acquired and were in competition in running through the town, including the PA and the B & O. back when New Haven was included in incorporation into the borough of Connellsville in 1911, first as a township, then as a borough. So many trains crisscrossed through here, with the B&O, Pa Railroad and the CSX, which is still here, that it eventually led to a huge wreck on the fateful day of Dec. 23, 1903. This did involve the Baltimore and Ohio. Basically, what appeared to of happened, in 1903, as it headed full tilt through from Pittsburgh to New York at 60 mph with 150 passengers, well, a few minutes earlier a 'Nickel Plate Road' freighter headed for New Castle lost a load of wood of sixty foot planks, unnoticed, on the eastbound track rounding a curve. The Duquesne didn't have time to do more than start to apply the brakes when it was already upon the wood, and in falling over the train ripped up the tracks as it barreled along causing much of the destruction of the train itself. The steam from the top of the damaged boiler ran along side of the window sections and many of the poor passengers were scalded to death. Another train derailment was barely averted. Added to this, the victims were then said to of been robbed of their personal possessions! This was variously said to of taken place, either 2 miles west of Dawson, or 8 miles west of Connellsville, near Laurel Run. Skirting the Yough from the southwest to the north and southeast, near what was called Gregg's Island, was the Fayette Coke Works with 103 ovens; the Brown and Cochran and the Sterling Coke Works; Morgan and Co, with only 26 ovens; then Laughlin & Co. and the Tyrone Mines with 108 ovens; Cochran and Strickler with 30 some ovens; then at Broadford; then, reaching Tyrone Station there past Broadford Run was the A. Overholt Distiller at the end of Crawford St. there. Then past the Reid Store and Broadford RxR Station. One of many areas around the borough where coke was King. Scott Blasey of the popular Clarks rock band,. He was lead vocalist from the start of the band. Born in Connellsville in 1964 and graduating from the Senior High School in 1982, he became an attendant of Indiana University of Pennsylvania. John Woodruff, (July 5, 1915-Oct. 30, 2007), was a local African American athlete and winner of the 800 meters event at the 1936 Summer Olympic Games. Born in Connellsville, Fayette County, 'Long' JOhn Woodruff', as he was known, was a freshman at the University of Pittsburgh when he placed second in the Nat. AAU and the 1st at the Olympic Trials. According to Wikipedia, (I believe this is accurate in this area), "Despite his inexperience, he was the favorite in the Olympic 800 metre run, and he did not disappoint. In one of the most exciting races in Olympic history, Woodruff became boxed in by other runners and was forced to stop running. He then came from behind to win at 1:52.9. Bob Bailor, (an acquaintance of my father, from Bob's fishing interests), of the Toronto Blue Jays,(also as coach for a few years), and the New York Mets and Los Angeles Dodgers professional baseball teams. In the late 80's he coached the Toronto Clue Jays. He was also born here, graduating from Giebel. Finally, William Andrews Clark Sr., (Jan. 8, 1839-March 2, 1935),the multi-talented individual. An entrepreneurial type who was an politician out west, a mine boss, leading banker and railroader; he was called a 'copper baron' back when. Yes, a copper baron, (all this is on Wiki), with paper mills, carding, grist, you name it really, they certainly had it in this city at one time or another. The city was said, comparatively, to of had more millionaires than any other American city. Unfortunately, the old prosperity has mostly long left the area in a depressed state, to put it bluntly. Especially so for those who well recall the great bustle of the place. The traffic, the holiday shopping here, the East Park festivals; this was indeed the Coke Capital and a real transportation hub of trains and their railroads; the Overholt Distillery; the Molinaro Band and the Hillcrest Rink; West Penn Trolleys; so much to so many. 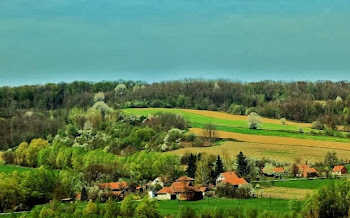 Still the beauty of the area remains to a large extent in the superb architecture of it's churches, buildings houses and, particularly, the natural surroundings of stream and the hills as you travel inward from the suburbs. There were more influential, well known people that would take up too much room here, I'm afraid, like John Lujack of Heisman Trophy fame and his stint with the Chicago Bears, and Ray Scott, Connellsville High School graduate back in 1936, a National Sportscaster of the Year with the Greenbay Packers. Edwin Stanton Porter, (April 21, 1870-April 30, 1941), was a real American film pioneer of the late 1800 to early twentieth century. He worked quietly with Thomas Edison's company and made 250 movies as a director and what is considered the most meaningful was 'The Great Train Robbery' and just maybe 'Life of an American Fireman' too. He was said to be a cautious, rather reclusive type, not at all outgoing, unusual in his career. Could this relate closely to forgotten history already? Well, follow some of the famous photos at Bud Murphy's when next you get a craving for a pizza and a beer. The Carnegie Free Public Library is an historic place at the heart of the city, but it is a shame there isn't more attention to activity now a days with the ongoing problems of illiteracy, though they certainly make a concerted effort toward improvement in this case. The impressive building was designed and built with the dedication and funds of Andrew Carnegie, the famous industrialist and philanthropist. One of a number of buildings on The National Register, the Connellsville Armory, the National Guard Armory and the Conn. Union Passenger or Pitt. and Lake Erie Station of the same named railroad. This was built in 1912. It is one and a half stories high, yet considered as two story on the administration side. Design was by the W. G. Wilkins Company, which also built the Mt. Pleasant Armory. Assuming this holds some meaning with the visitors here, the founder lived from 1854-1921 and was heavily involved in the creating of many coke plants, as was Joseph Kuntz, a quality architect out of Pittsburgh who made the Scottdale and Latrobe Armories. A quick observation is in order, as quite a few of the more renowned industrial era buildings in Connellsville are on the list of The National Register Of Historic Places, so for sake of space and possible tedium, we will spare the enumeration of all of them, including the Post Offices, some Colonial style buildings and historical churches, theaters, and also the schools, if you don't mind. Certain businesses would be a fair part of this non-existent list, most of which, unfortunately, are long defunct. If you're anything like myself, there is a twinge or pang of regret for what was a huge spread of growth and prosperity at the turn of the nineteenth to the twentieth century, something once taken almost for granted in those heady hey-days. We have such fond memories of so much that was here in different forms over the years, so there is some discretion in relating their various histories in detail, particularly when toward so many of these fine old places, as the owners, sadly, have left the area or went bankrupt many years on. The south section of the Youghiogheny River Trail, popular with hikers and fishermen, runs through here between Confluence, (a place for the crossing of the old Turkey Foot Road), and the city and to McKeesport and beyond in the northern sections. The nine access areas are all free to use. Remember, overnight camping is for one night only. Am Trak runs passenger service nearby. Alas, not at the old Union Depot built in 1912 which went out of rail usage by 1939. You can still find the old trolley road between Ferguson and Mt. Braddock, not far from the ball field. The Gist Plantation sign is just south of Cellurale Drive on Rt. 119 heading north from Uniontown, near Dunbar. Christopher Gist, a frontiersman, guide and surveyor, of course was an early settler that had this plantation and was visited by Washington here in 1754. He considered using his base as the defense against the French instead of the Meadows Fort Necessity area at Farmington. His mill and cabins were soon to be destroyed by the French. The Meason House is slightly north of here on the same University Drive, (119), and also has an historical marker. It is only fair to offer a few examples of more recent era locations: The Nut Shop, (of which there was one in Scottdale), was at 141 W. Crawford Ave; the New Haven Opossum Run bridge was carried away in the big rain storm of 1901; in the 1940's there was the Connellsville Bottling Works that made "Spur", a cola drink that cost 5 cents,"with Canada Dry Quality"! Here's an old one, the R. S. Paine Shoe store on Pittsburgh Street, I know not exactly where..and the oldest shoe store, Johnston and Morris, was on Main Street in the 1880's and a lot earlier. They were advertised as "Very Cheap". J. W. Ward had a Photography Studio at 8-something Pittsburgh Street. C. M. Miller's Hardware Store was on Perry Street. Isaac Meason Jr. had the Yough Coke Company near Broadford. There was old Paine's Shoe store on Pittsburgh, old Church Street); New Haven had Miller's General Hardware Store. Let's also be reminded of Chinn's Hardware Store in town at 305 N. Pittsburgh long ago. Melnick's sold quality women's clothing at 112 on the same street. A business concept that would interest quite a few of you nowadays, John Barge had a Mineral Water delivery service in Connellsville in 1889. You are probably well aware this list could go on and on. But, after all, it still has Domino's Pizza and Bud Murphy's and so much besides, doesn't it? Minus the High Constable and the 'Quaker Graveyard School'. I had to add something for Halloween. As has been recently brought to my awareness, a quick statement on the type of material chosen to pass on for the website may be in order. There is much in the way of the mainstream history concerning stores, banks, churches, street names and the like that can be looked on as more mundane and slightly less interesting and unrepresented here. Now, I don't hold completely to this view, as I do mention what would be seen as more modern items of interest, now and then. To better explain, often those very meaningful things in their own right are better covered by newspapers, books, various newsletters and other good organizations quite well. With the changing bank names and the shifting city halls, the history of Connellsville continues to renew and reinvent itself as sure as there is a Brimstone Corner. Please understand, when I state some of what is most significant to many of a certain ilk or predilection, other issues are not always included on this site for less prejudicial reasons. One explanation is that the task is simply too daunting and would lead to very long, drawn out posts. That, my friend, may appear to be a cop out, but not really. I simply desire to best be able to keep the average person's attention and be better able to deliver an occasional object of fascination and examples with real intrigue for the readers. I do hope what is attempted in my coverage is good enough to accomplish that in a fair degree. By the 'hits' steadily rising every week, this may well be the case. The blog does neglect a story or happening once in a while, I freely admit, that is probably considered meaningful and headline material for many. This is not necessarily on purpose, though. For one thing, it might be I just haven't thought of it, something has slipped my mind, (slightly overworked, underpaid, non-youthful, slowly deteriorating; pick one of the above), or more likely, I'm not so well informed about everything going on. PLEASE then, do your small, but meaningful part and get on here, type some lines and leave a guiding word for me, and others, critical or condoning and add what information you feel is valuable. At that junction, there is no real excuse to hide behind, but my own failure to respond to what is wished for. If that was the case, Histbuffer would no longer deserve your readership and valued visitations and might become a wandering unshaven derelict, smoking cigars, drinking heavily and eating candy all night, searching for meaning in a mud puddle. Think of that for a second! You don't want that on your conscience, it's understood. Take that chance and inform me about something that really matter to YOU, OK?! It's worth it for your sake. This is important stuff-our history. Without replacement. And I probably won't become a complete wallower in self-pity or commit any type of dreaded suicide. Alright then, I asked for it. Anyway, as I have said in a few other posts, otherwise how am I to be thoroughly up to date on what the audience expects or most would like to see researched without your insightful input. Those of you that do write me, or do respond, you are aware that it is always appreciated and I make an effort to respond in kind. I thank you! Here are presented a handful of the rarer objects, dustier tidbits, stories and events often farther removed from our day and our time, sitting somewhere on a half rotten shelf, so dim, that hardly anyone remotely remembers where exactly the room is that contains it. That's our fare. With the objective to bring something of substance from shadow to light. If I offend someone with consistently presenting too old an amalgam of tradition and ancient beginnings, then, you know what, they are probably too easily upset! How do i do it on yours. Thanks for the inquiry Cassandra. Sorry, I assumed the atom feed was sufficient. Does your subscription feed include e-mail alerts? Could be I will have to make an addition!